Hello mixed media’s fans! Mary here with you today and I’m going to show you how I made a canvas using several Starbursts and Flat Sprays as well as Embossing Powder from Lindy’s. I started by covering my canvas with black gesso. 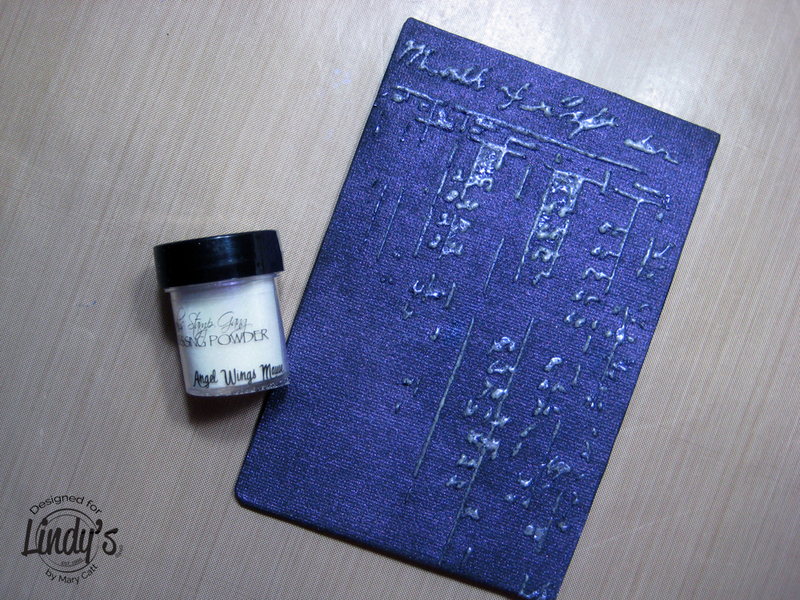 When this had dried, I applied black modeling paste through a stencil and because I wanted to give it, even more, texture I heat embossed the pattern with ”Angel Wings Mauve” embossing powder. The shimmer really stands out on the black background. Then, I gave all the embellishments a coat of black gesso. I glued down all the embellishments. Then, I mixed black gesso and art stones with soft gloss gel and applied it on the canvas to create more texture. When everything was dry I highlighted some spots with white gesso, this helps make the patterns and shapes stand out. I used the sprays Pop Rock Purple, Tea Pot Purple, Prima Donna Purple and Hydrangea Blue to add color to the canvas. To finish, I made some splatters with White Acrylic Artists Ink. Here are some close-ups so you can see the details. Thank my friends for your time!